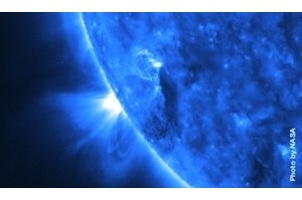 The massive planet passed behind the sun and arrived with a brand new decoration. When Jupiter emerged from its annual pass behind the sun last March, amateur astronomers saw a brand-new blotch of vermilion on the solar system’s largest planet, just west of the Great Red Spot, Jupiter’s signature storm. NASA’s Hubble Space Telescope and the Keck II in Hawaii were soon trained on the so-called baby red spot, which seemed destined to collide with the big one. “They were at the same latitude, and they were moving toward each other,” says astronomer Imke de Pater of the University of California at Berkeley.